"Investment Strategy" and "After Apple-Picking" by Robert Frost--I post another Podcast! Tonight I became ambitious and posted a second podcast about my investment strategy and I also read a poem by Robert Frost, "After Apple-Picking." If you have any comments or questions please feel free to leave them on the blog or email me at bobsadviceforstocks@lycos.com. FTI Consulting (FCN) "A New Podcast!" I have been working hard to catch up with a few things this weekend. Including a podcast! CLICK HERE FOR MY PODCAST ON FTI CONSULTING (FCN)! Have a wonderful week and I hope you enjoy my podcast! Dearborn Bancorp (DEAR) "Long-Term Review #15"
It is hard for me to believe that I am approaching my fifth anniversary here on this blog. My first entry was posted back on May 12, 2003. And since then I now have a total of 1,766 entries (not including this one). Needless to say, it is hard to find entries when there are so many to go through! And it is even harder to assess how all of these stocks discussed and revisited are doing. With that in mind, I started a new entry called "Long-Term Review" and have been trying to dig back into the early days of the blog and share with you how those stocks all turned out. They haven't all been profitable. My last long-term review was done on October 21, 2007, when I reviewed NVR as my 'long-term review #14' from May 23, 2003. My next stock picked on the blog was Dearborn Bancorp (DEAR) which I wrote up on May 27, 2003. There may be other people who are better at assessing bank stocks which have their own group of analysts. However, on our little system, Dearborn showed up today on the list and it deserves a mention! Bob"
Dearborn (DEAR) has had a series of 5% stock dividends. Thus adjusting for multiple splits we get an adjusted pick price of $22.50 x 100/105 (2003) x 100/105 (2003) x 100/105 (2004) x 100/105 (2004) x 100/105 (2005) x 100/105 (2006) x 100/105 (2006) = $15.95. Anyhow, DEAR closed at $6.99 for a loss of $(8.96) or (56.2)% since posting. On January 15, 2008, Dearborn Bancorp (DEAR) reported 4th quarter 2007 results. For the quarter ended December 31, 2007, net income was $398,000 or $.05/diluted share, compared to net income in 2006 during the same period of $2,252,000 or $.29/diluted share. Checking the Morningstar.com "5-Yr Restated" on DEAR, we find that revenue has continued to increase from $12 million in 2002 to $29 million in 2006 and $34 million in the trailing twelve months (TTM). Earnings, however, peaked at $1.20/share in 2005 from $.66/share in 2002. Earnings dipped to $1.17/share in 2006 and down to $.59/share in the TTM. Outstanding shares have increased from 4 million in 2002 to 7 million in the TTM. This is o.k. in light of the revenue increase, but earnings during this period, with the latest dip included, means that they are actually lower dipping from $.66/share in 2002 to $.59/share in the TTM. Free cash flow is negative at $(34) million in 2004, $(2) million in 2005, $(53) million in 2006 and $(47) million in the TTM. I know that we cannot really judge banking stocks in the same fashion as we do companies that make some sort of 'widget', but still, the numbers are discouraging. Reviewing the 'point & figure' chart on Dearborn (DEAR) is a bit discouraging. The stock made a terrific move higher from $3.50 in November, 2002, to a peak of $25 in June, 2004. The stock was unable to break this level and in fact broke down entirely in July, 2007, when the stock dipped below $13. More recently, the stock appears to have found some new level of support in the $6.00 range and may well be poised to move higher. However, I would need to see the stock trading nort of $12.50 to find some encouragement of that idea. Thanks so much again for visiting my blog! If you have any comments or questions, please feel free to leave them on the website or email me at bobsadviceforstocks@lycos.com. If you get a chance, be sure and visit my Covestor Page where my Trading Portfolio is reviewed and analyzed, my SocialPicks Page where all of my stock picks from the past couple of years are reviewed, and my Podcast Page where, if you are still up for it, you can download a radio show or two of mine discussing some of the many stocks I write about here on the website. Wishing you all a wonderful Sunday and a good week to come! ResMed (RMD) "Weekend Trading Portfolio Analysis"
With the market correction ongoing, my portfolio has been reduced in size (as it is supposed to!) down to seven positions. As is my practice, I have been trying to share with you my performance on the actual stocks that I own in addition to the many stocks I write about on this blog. My last review was Morningstar (MORN), a holding that I discussed on January 19, 2008. Going alphabetically (by symbol) I am up to my ResMed position. I currently own 150 shares of ResMed (RMD) that were acquired on 2/4/05 at a cost basis of $29.87. ResMed closed at $40.49 on 2/29/08 for an unrealized gain of $10.62 or 35.5% on these shares. ResMed is an old favorite of mine, having first reviewed the stock (before owning the shares) back on December 5, 2003, when the stock was trading at $41.76. Adjusted for the 2:1 stock split on October 3, 2005, this works out to a pick price of $20.88. The stock has actually appreciated $19.61 or 94% since that original posting. As is my practice, I have sold portions of my ResMed position twice as they hit appreciation targets of 30% and 60% over the purchase price. I sold shares 9/27/05 at a split-adjusted price of $38.82, representing a gain of $8.95 or 30.0%, and another batch of shares at $47.47 on 5/5/06, representing a gain of $17.60 or 59.0% since purchase. Well, on the downside it has been my policy to sell shares if they retrace back to 1/2 of the highest percentage at which I have sold shares (if I have sold more than once). In this case, with the highest % sale at the 60% appreciation level, I plan on selling all of my shares should ResMed trace back to the 30% appreciation level (which it has been flirting with several times already). This would work out to 1.3 x $29.87 = $38.83. On the other hand, if the stock should move higher, the next targeted sale in my 'system' is at the 90% appreciation level at which time I would plan on selling 1/7th of my remaining shares. This works out to 150 x 1/7 = 21 shares, which would be sold should the stock reach 1.9 x $29.87 = $56.75. Unfortunately, the stock is far closer to the sale on the downside rather than the sale on appreciation. Time will tell. Let's take a closer look at this company and decide how we should rate this stock for the blog! "...engages in the design, manufacture, and marketing of equipment for the diagnosis and treatment of -disordered breathing, including obstructive sleep apnea, and other respiratory disorders that occur during sleep. 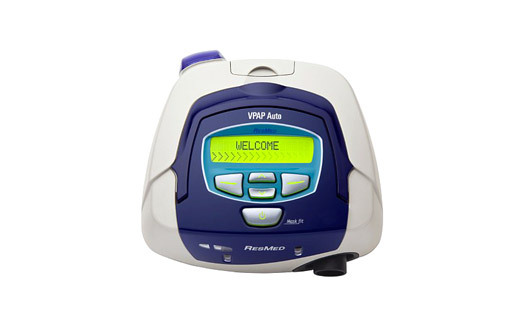 It offers airflow generators, diagnostic products, mask systems, headgear, and other accessories, including humidifiers, cold passover humidifiers, carry bags, and breathing circuits." On February 8, 2008, ResMed (RMD) reported 2nd quarter 2008 results. For the quarter ended December 31, 2007, revenue increased 14% to $202.7 million from $178.4 million a year earlier. This exceeded estimates of $183.8 million. Earnings dipped to $26.9 million or $.34/share this year compared to last year's $29 million or $.37/share. However, removing one-time stock-based compensation costs and restructuring charges and other one-time items, profit came in at $32.1 million or $.41/share, down from $33.7 million last year. However, the $.41/share figure exceeded estimates of $.35/share according to analysts polled by Thomson Financial. Reviewing the Morningstar.com "5-Yr Restated" financials page, we can see a little bit of a mix of results. Revenue growth has been particularly stable with $274 million in 2003 increasing to $716 million in 2007 and $763 million in the trailing twelve months (TTM). Earnings had a steady growth record from 2003 to 2006 when they increased from $.67/share in 2003 to $1.16/share in 2006. Earnings however dipped to $.85/share in 2007 and $.81/share in the TTM. These results of course exclude 'one-time' events. But they should be respected. Free cash flow has improved after dipping from $31 million in 2005 to a negative $(4) million in 2006, improving to $14 million in 2007 and $22 million in the TTM. The balance sheet is solid with $279.0 million in cash and $411.0 million in other current assets. This total of $690 million, when compared to the $162.7 million in current liabilities yields a current ratio of 4.24. (I use a level of 1.25 on the current ratio as a minimum to consider the balance sheet 'healthy'.) RMD has a relatively small level of long-term liabilities at $142.0 million. Examining the Yahoo "Key Statistics" on ResMed (RMD), we can see that this is a mid cap stock with a market capitalization of $3.15 billion. The trailing p/e is rather rich at 50.24, the forward p/e (fye 30-Jun-09) is estimated at 21.77 and with the rapid growth in earnings expected, the PEG ratio works out to an acceptable level of 1.46. Utilizing the Fidelity.com eresearch website, we find that the Price/Sales (TTM) is reasonably priced at less than its peers at 4.12, compared to an industry average of 4.91. The company is not as profitable as its peers per Fidelity with a Return on Equity (TTM) of 6.66% compared to the industry average of 20.68%. Finishing up with Yahoo, we find that there are 77.68 million shares outstanding with 75.14 million that float. As of 1/10/08, there were 5.85 million shares out short, well above my 3 day rule of significance, with the short ratio working out to 8.1 days of trading volume. No dividends are paid and the last stock split was a 2:1 paid on October 3, 2005. 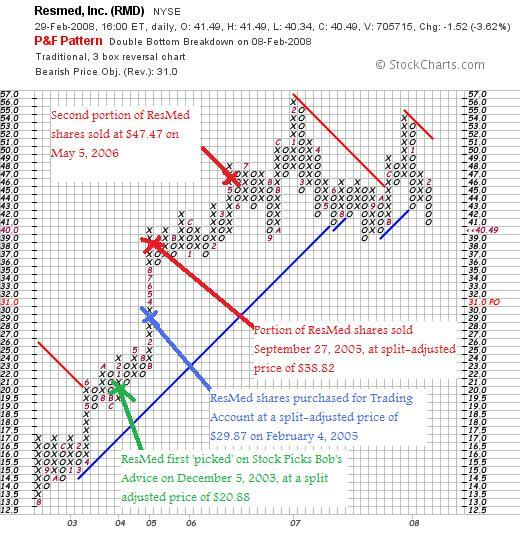 Reviewing the 'point & figure' chart on ResMed from StockCharts.com, we can see the strong price appreciation from August, 2002, when the stock was trading at $13.00/share, to a peak of $56 in February, 2007. The stock broke through support on the downside in August, 2007, when it dipped below $42. The stock has been struggling technically (from my amateur perspective) and once again broke through support at $42 this month. Short-term, the chart looks weak without showing a complete break-down in support. I really am very biased about this stock. I think there are loads of people out there with sleep apnea and Resmed has a great product and great future. THAT is my 'Peter Lynch' portion of this stock pick. I have some concerns about the latest quarter with all sorts of one-time charges needing to be sorted out to get to a result that still shows a decline year-over-year. And this has been going on for at least a year as the Morningstar.com report suggests. Furthermore, valuation is a bit rich with a p/e over 50 (although I can live with the PEG). The Price/Sales suggests a reasonable valuation, but the Return on Equity suggests that profitability might be lagging. The rest of the Morningstar report is solid. However, the chart also gives me pause. What this company really needs is a blow-out quarter! Thanks again for stopping by and visiting my blog! If you have any comments or questions, please feel free to leave them right on the website or email me at bobsadviceforstocks@lycos.com. If you get a chance, be sure and stop by my Covestor Page where you can see how my Trading Portfolio is doing relative to the S&P and other investors, my SocialPicks page where my stock picks from the last year or two are reviewed and analyzed, and my Podcast Page where you can download a show or two about some of the many stocks I write about here on the website! Wishing you a happy weekend and a successful week ahead trading! It is Saturday and it is time for a review of this blog. As I like to do on weekends, I have been going back about a year and examining a week of stock picks to see how they all would have turned out had I purchased shares in all of them. This review assumes a 'buy and hold' approach to investing. I actually write about and personally employ a disciplined investment management system which requires me to sell my holdings if they do poorly, and to sell portions of my best-performing holdings as they appreciate. The difference in strategies would certainly affect performance. Last week I took a look at picks from the week of August 7, 2006. Going a week ahead, let's examine the selections from the week of August 14, 2006. Fortunately for this reviewer there was only one stock 'picked' that week, Sonic Corporation (SONC) which was reviewed on August 14, 2006. Sonic was trading at $21.75 when I wrote up the stock on August 14, 2006. SONC closed at $21.33 on February 29, 2008, for a loss of $(.42) or (1.9)% since posting. I do not own any shares nor do I have any options on this stock. This was the only stock discussed that week so I had a performance of (1.9)% on the stock that week. What exactly does Sonic (SONC) do? "...operates and franchises a chain of quick-service drive-in restaurants in the United States. 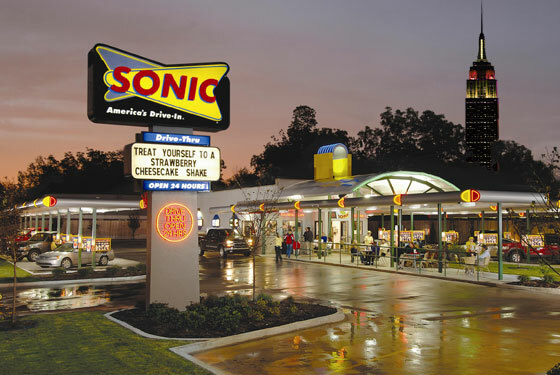 As of August 31, 2007, the company operated 3,343 Sonic Drive-Ins, including 654 partner drive-ins and 2,689 franchise drive-ins." On January 3, 2008, Sonic reported 1st quarter 2008 results. For the quarter ended November 30, 2007, revenues climbed 9% to $190.2 million from $174.8 million the prior year. Same-store sales increased 2.1% during the quarter. Net income decreased to $13.6 million from $15.3 million the prior year. However, due to fewer shares outstanding (63 million in 2007 vs. 79 million in 2006), the diluted earnings per share actually increased to $.22/share from $.19/share last year. "The company's higher earnings per share also reflected the positive impact of Sonic's capital management program, under which the company has repurchased more than 30% of its outstanding stock since the beginning of fiscal 2007, with total expenditures of approximately $590 million. The reduced shares outstanding helped offset, on a per share basis, higher net interest expense related to the company's tender offer completed in October 2006 along with subsequent open-market purchases. With the higher interest expense, however, net income for the first quarter of fiscal 2008 declined 11% to $13.6 million versus $15.3 million in the year-earlier quarter." The company did beat expectations on earnings which were estimated to come in at $.21/share however, they missed on revenue which was expected to come in at $191.5 million (Sonic came in at $190.2 million) according to analysts polled by Thomson Financial. Reviewing the Morningstar.com "5-Yr Restated" financials on Sonic, we have really quite a 'mixed bag' of results. Revenue growth remains fairly solid with an increase from $447 million in 2003 to $770 million in 2007 and $786 million in the trailing twelve months (TTM). Earnings have also been improving nicely from $.52/share in 2003 to $.91/share in 2007 and $.94/share in the TTM. This has been driven by a concerted effort by management to retire outstanding shares as noted in the above comments and by the observation that after peaking at 89 million shares in 2004, outstanding shares dropped to 88 million in 2005, 77 million in 2006 and 64 million in 2007. However, examination of the Net Income figure shows a nice increase between 2003 and 2006 when this figure increased from $48 million in 2003 to $79 million in 2006. However, the income/share figure hides the fact that net income actually dropped between 2006 and 2007 from $79 million to $64 million. In addition, things are still problematic as the trailing twelve months net income figure is even lower at $62 million. Free cash flow has dropped steadily from 2005 when it came in at $42 million and has declined steadily to $6 million in the TTM. The balance sheet is also a bit 'iffy' with $29 million in cash and $41 million in other current assets. This total of $70 million is inadequate to cover the current liabilities of $96.4 million. In fact, this yields a current ratio of .73. As you may know, I like to see a current ratio of at least 1.25 before suggesting the balance sheet is 'healthy.' To top it all off, the company has $770.5 million of long-term debt on the books resulting in shareholders' equity of $(102) million. Referring to Yahoo "Key Statistics" on Sonic, we can see that this stock is a mid cap stock with a market capitalization of $1.30 billion. The trailing p/e is a very reasonable 22.69 with a forward p/e (fye 31-Aug-09) estimated at 16.16 yielding a nice PEG ratio of only 1.09. Examining the Price/Sales (TTM) ratio on the Fidelity.com eresearch website, we find that the stock is a good value by this ratio as well with a Price/Sales ratio of 1.72 well under the industry average of 3.29. The company is less profitable than its peers with a Return on Equity (TTM) of (84.53)% compared to 18.74% according to Fidelity. I assume this negative figure derives from the negative shareholders' equity as noted in the above statistics from Yahoo. Finishing up with Yahoo, there are 60.81 million shares outstanding with 57.31 million that float. As of 1/28/08 there were 9.11 million shares out short representing 5.9 trading days of volume. This is above the 3 day rule and is generally 'bullish' from my perspective. No dividends are paid and the last stock split was a 3:2 split May 1, 2006. 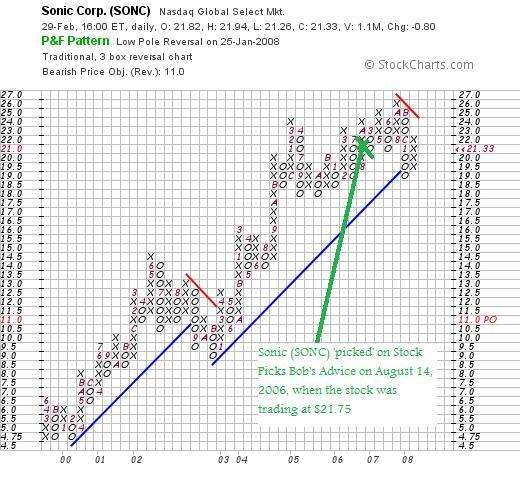 Taking a look at the 'point & figure' chart on Sonic from StockCharts.com, we see a fairly strong chart with the stock price climbing from the $4.75 level back in February, 1999, to a peak of $26 in October, 2007. Currently the stock is under a little pressure haveing dipped below the 'support line' but with the latest bullish move, the stock doesn't really appear to have broken down technically. Reviewing the information I just presented, this is certainly a mixed-picture of results. Looking first at the latest quarter we do find some good things including the fact that same-store sales results were positive, and that earnings beat expectations. However, I am concerned that revenue missed on expectations and actually while earnings per share improved, the overall net income actually decreased as the company used a large amount of resources to buy back shares and decrease the float. Longer-term, we have the same problem. The company is expending resources to buy back shares while the bottom line appears to be suffering. The decreased shares presents an appearance of a healthy company with increasing earnings per share but at a big cost to shareholders who are seeing increasing levels of debt, a negative shareholders' equity, and declining free cash flow. With a current ratio of less than 1.0, I am not sure the short-term management is dealing appropriately with the balance sheet. O.K. I am an amateur, but after looking at so many different companies I am disturbed by this trend. On a positive note, valuation is reasonable in regards to p/e ratios, PEG, and Price/Sales, but we have the unusual finding of a negative 'return on equity' which I assume is related to the negative shareholders' equity. With a clean-up of the balance sheet and a reduced emphasis on buying back shares and instead investing in the company itself, I might feel a little more comfortable owning shares of this stock. Anyhow, that's my amateur take on this company. If you have any comments or questions, please feel free to leave them on the blog or email me at bobsadviceforstocks@lycos.com. If you get a chance, be sure and visit my Covestor Page where you can see how my actual Trading Portfolio is performing, my SocialPicks Page where my many past stock picks from the past year or so are reviewed, and my Podcast Page where you can download an amateur radio show of mine as I discuss some of the many stocks I write up here on the blog. Wishing all of you a pleasant weekend and a great week ahead! FTI Consulting (FCN) "Revisiting a Stock Pick"
The market resumed its correction yesterday (2/29/08) with the Dow dropping 315.79 to 12,266.39, the Nasdaq dropping 60.09 to 2,271.48 and the S&P giving up 37.05 to 1,330.63. Meanwhile, inflation concerns continue to be an issue with oil remaining over $100/barrel at $101.84 and gold soaring to $975.00/ounce. Adding to inflation concerns in America is the weakness of the dollar as it dropped to a record low against the Euro last week. Meanwhile Ben Bernanke continues to indicate that he is prepared to cut interest rates further to support the economy even while such cuts may likely fuel the continued drop in the dollar and thus inflation concerns. Even though this weak economy, in conjunction with soaring oil and commodity prices and evidence of increasing price inflation might suggest the notorious 'stagflation' scenario, Fed Chairman Bernanke testified to the contrary. Let us hope that he is correct. In the midst of all of this gloom and doom, I still look for new stocks or old stocks that I have reviewed previously, to show up in my own evaluation of equities. That doesn't mean I am prepared to be buying anything. As you may or may not know, I use my own portfolio actions to determine my own investment strategy. In other words, I wait for one of my own stocks to hit an appreciation target and triggers a partial sale to give me a 'signal' to be buying a stock. I also 'sit on my hands' when I sell stocks on 'bad news'. This creates a more or less investment barometer that allows my portfolio to drift between five (my minimum), and twenty (the maximum) number of postions. I currently hold seven different equities. Looking for new names to discuss here on this website, I scan the lists of large percentage gainers. Yesterday, I saw that FTI Consulting (FCN) made the list of top % gainers on the NYSE. Reviewing some of the underlying data on this company, it appeared that it deserved a 'revisit' and an update here on Stock Picks. FTI Consulting (FCN) closed at $63.50/share yesterday (2/29/08) for a gain of $7.62 or 13.64% on the day. I do not own any shares nor do I have any options on this company. First of all, I say "revisit" on this entry because I first wrote up FTI Consulting (FCN) on Stock Picks Bob's Advice on August 6, 2003, just a few months after getting this blog started when the stock was trading at $21.90/share. With FCN closing at $63.50, this represents a gain of $41.60 or 190% since posting. "...provides consulting services to organizations confronting the legal, financial, and reputational issues. It provides advice and solutions to corporations, financial institutions, and law firms in the areas of forensic analysis, investigation, economic analysis, restructuring, due diligence, strategic communication, financial communication, and technology." As is often the case, an outstanding earnings report is what provides the 'fuel' to drive a stock sharply higher. In this case, after the close of trading on Thursday, February 28th, FTI Consulting announced 4th quarter 2007 results. For the quarter ended December 31, 2007, revenue climbed 29.4% to $280.5 million, up from $216.8 million the prior year. Earnings climbed 42.9% to $.60/share from $.42/share the prior year. As the report points out, the company managed to increase its earnings "...despite a 24.1 percent increase in the weighted average shares outstanding to 51.3 million shares from 41.4 million shares in the prior year period." Just as important as the solid earnings report was the fact that the company beat expectations with this report. According to Reuters Estimates, analysts had been expecting earnings of $.58/share (they came in at $.60), on revenue of $261.5 million (they came in at $280.5 million). The company has recently been busy acquiring other companies and likely using the issuance of shares to finance this activity. They acquired TSC Brasil as announced just the other day, Thompson Market Services Ltd. announced on February 19, 2008, and Strategic Discovery announced on Febrary 12th, Rubino & McGeehin also on February 12th. However, FCN appears to be using its shares well as at least in the past quarter, the issuance of shares was more than offset by growth in earnings and revenue. Reviewing the Morningstar.com "5-Yr Restated" financials on FTI Consulting (FCN), we see a strong, if imperfect record for the company. Revenue has grown strongly from $224 million in 2002 to $708 million in 2006 and $938 million in the trailing twelve months (TTM). Earnings have increased from $1.09/share in 2002 to $1.82/share in the TTM. However, earnings did dip from $1.41 in 2003 to $1.01 in 2004 before rebounding to $1.35/share in 2005. Earnings also dipped from $1.35/share in 2005 to $1.04/share in 2006 before rebounding strongly to $1.82/share in the TTM. Overall the trend is for strong earnings growth. Total shares have grown from 38 milliion in 2002 to 44 million in the TTM. (and up to 51.3 million shares as reported in the latest quarterly earnings announcement.) This increase from 38 million shares in 2002 to 51 million shares---about a 33% increase in shares, has been accompanied by an increase of about 300% in revenues during the same time and an approximately 70% increase in earnings, again demonstrating that the company has been able to increase its financial performance much stronger than the dilutive effects of increased shares. Free cash flow while also not rising in a linear fashion, has been consistently positive and growing recently with $47 million in 2004 increasing to $34 million in 2006 and $72 million in the trailing twelve months. The balance sheet appears solid with $62 million in cash and $306.0 million in other current assets. The current ratio is close to 2.0 with $183.2 million in current liabilities reported. The company does have a fairly significant long-term liabilities load reported at $667.8 million. Reviewing the Yahoo "Key Statistics" on FCN, we can see that this is a mid cap stock with a market capitalization of $3.05 billion. The trailing p/e is 35.08, with a forward p/e (fye 31-Dec-08) estimated at 21.45. The PEG ratio (5-yr expected) is reasonable at 1.40. In terns of the Price/Sales ratio, according to the Fidelity.com eresearch website, the company is richly priced with a Price/Sales (TTM) ratio of 2.88 compared to the industry average of 2.09. Also from Fidelity, we see that relative to other companies in the industry, the profitabiltiy of FCN is unimpressive as measured by the Return on Equity (TTM) of 12.78% compared to the industry average of 28.36%. Returning to Yahoo, we can see that FCN has 48.06 million shares outstanding (up to 53 million as reported in the latest quarterly report), with 47.32 million shares that float. As of January 10, 2008, there were 5.04 million shares out short representing 6.9 trading days of volume (the short ratio). This is higher than my own '3 day rule' suggesting that this volume of short-selleres might have led to a bit of a squeeze yesterday on the announcement of strong earnings news driving the stock higher in the fact of an overall weak market. No dividends are paid and the last stock split was a 3:2 split on June 5, 2003. 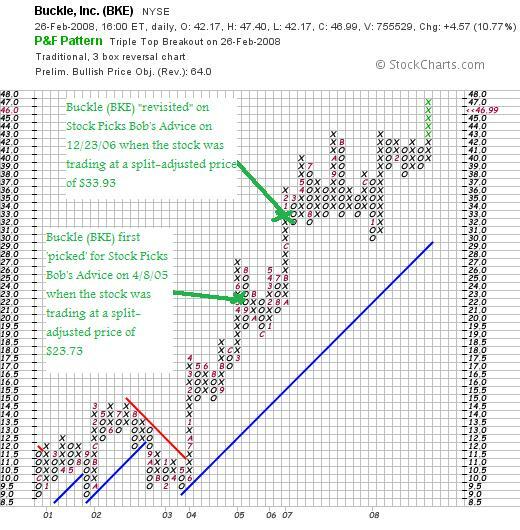 Reviewing the 'point & figure' chart on FCN from StockCharts.com, we can see a chart of what I would have to describe as amazing strength going back all the way to January, 2000, when the stock was trading at $1.50/share. there have been periods of relative weakness but the stock chart really hasn't broken down at all and currently is showing renewed strength. To summarize, FTI Consulting (FCN) made an extremely strong move higher yesterday in the face of a very weak market. This was likely based on the fact that the company announced strong earnings that beat expectations on both revenue and earnings figures. They did this with a fairly large population of 'nay-sayers' on board represented by the significant short interest. Longer-term the company has been a bit erratic with earnings but has maintained a strong record of revenue and earnings growth with relatively stable outstanding shares outpaced by revenue and earnings increases. Free cash flow is positive and growing and the balance sheet is quite acceptable. Valuation is a bit mixed with a reasonable p/e relative to growth as represented by a PEG of about 1.4. The Price/Sales and the Return on Equity appear to be a bit anemic relative to their peers. The price chart is incredible showing a very strong picture of price appreciation that appears unabated. Overall I liked this stock in 2003 and I still like this stock in 2008! I am not ready to buy any shares as I do not have my own idiosyncratic indicator to be buying anything at all, but if I were....this is my kind of stock! Thanks again for visiting! If you get a chance, be sure and visit my Covestor Page where you can find my actual trading portfolio and monitor my actual trading performance, my SocialPicks page where my many stock picks from the past couple of years are reviewed, and my Podcast Page where you can listen to me discuss many of the same stocks I write about here on the blog! Wishing you a wonderful weekend and a great week trading and investing next week. Buckle (BKE) "Revisiting a Stock Pick"
Scanning through the list of top % gainers on the NYSE from earlier today, I was pleased to see an 'old favorite' of mine, Buckle (BKE) on the list, closing at $46.99, up $4.57 or 10.77% on the day. I say 'old favorite' even though I do not own any shares or options on this stock, because I have written this one up previously. Almost three years ago, on April 8, 2005, I wrote up the Buckle (BKE) when it was trading at $35.60/share. Buckle split 3:2 on January 16, 2007, making that price effectively $35.60 x 2/3 = $23.73. Thus with today's close at $46.99, this represents a gain of $23.26 or 98% since that post! I next wrote up Buckle (BKE) on December 23, 2006, when the stock was trading at $50.90. Again, adjusted for the 3:2 split the following month, this works out to a price of $50.90 x 2/3 = $33.93. Again, with today's close at $46.99, this represents a gain of $13.06 or 38.5% since that post! Since we are talking about prior stock prices and picks and the current price, let's take a look at a 'point & figure' chart on BKE from StockCharts.com which can give us some perspective. Certainly we can see the extremely strong price performance of this stock which broke through resistance last in June, 2003 at the $11.50 level and hasn't broken down this uptrend since then! "...operates retail stores that offer casual apparel, footwear, and accessories for young men and women in the United States. It markets casual apparel, including denims, bottoms, tops, sportswear, outerwear, accessories, and footwear under the Buckle and The Buckle brand names. As of April 1, 2007, The Buckle operated 351 stores in 38 states in 4 downtown locations, 9 strip centers, 20 lifestyle centers, and 318 shopping malls." While the economy may well be struggling with a possible recession, retail sales actually climbed in January, 2008. Lowes is seeing reduced same store sales, Macy's is experiencing declining same-store sales, Nordstrom is also experiencing declining same-store sales. "Same-store sales are widely reported by publicly-owned retail chains as a key element of their operational results. For chains that are growing quickly by opening new outlets, same store sales figures allow analysts to differentiate between revenue growth that comes from new stores, and growth from improved operations at existing outlets." So I was extremely impressed when I read this story from February 7, 2008, in which Buckle (BKE) reported same-store sales increase of 19.1% in January. And this growth was not a fluke; same store sales increased 18.7% in the fiscal fourth quarter which ended February 2, 2008. What about the latest quarter? On November 21, 2007, Buckle (BKE) reported 3rd quarter results. Net sales for the quarter increased 17.1% to $167.6 million from $143.1 million the prior year. For the quarter, comparable store sales increased 14.3% over the prior year. (This sales growth actually accelerated in the 4th quarter as the above paragraph noted to 18.7%). Net income for the 3rd quarter of fiscal 2007 was $22.2 million or $.72/diluted share up from $.59/diluted share for the third quarter of fiscal 2006. Outstanding shares have actually decreased from 32 million in 2003 to 30 million in the TTM. Free cash flow has stayed positive at $56 million in 2005 and $59 million in 2007. The balance sheet is solid with $151.5 million in cash. The cash alone is enough to pay off the $49.2 million in current liabilities more than 3x over, as well as paying off the combined current and long-term liabilities of $81.6 million almost two times over. And that is without even taking into consideration the additional $86.8 million in other current assets. The Morningstar.com report is really quite impressive! Reviewing Yahoo "Key Statistics" on Buckle (BKE) we can see that this is a mid-cap stock with a market capitalization of only $1.41 billion. The trailing p/e is a moderate 21.13, with a forward p/e (fye 03-Feb-09) estimated at 19.26. The PEG is a very reasonable 1.19. Using the Fidelity.com eresearch website, we find that the Price/Sales ratio is a bit rich relative to its peers at 2.16 compared to the industry average of 0.86. The return on equity (TTM) is comparable to its peers with a figure of 22.05% compared to the industry average of 23.51% according to Fidelity. Finishing up with Yahoo, we can see that there are 30.05 million shares outstanding with 14.17 million that float. Currently, there are 1.97 million shares out short (as of January 10, 2008) resulting in a short ratio of 5.1. I use 3 days as my cut off so this is modestly significant. The company does pay a dividend of $1.00 going forward yielding 2.4% which isn't insignificant. The last stock split, as I noted was a 3:2 split on January 16, 2007. Needless to say I like this stock. I mean I really like this stock! I have 'picked' this stock twice before for this blog and it has climbed in price each time. Of course, THAT is no guarantee that it will climb once more! But seriously, the company has been reporting solid same-store sales growth in an otherwise weak retail environment. They actually have accelerated in this growth in the fourth quarter from the prior quarter. And longer-term they have shown consistent growth in revenue, earnings, dividends, while slightly decreasing their outstanding shares. Free cash flow is solid and the balance sheet is gorgeous. And finally, the chart is awesome while valuation figures, while not overtly cheap are reasonable imho with a p/e just over 20 and a PEG just over 1.0. The Price/sales and the ROE figures are a bit unimpressive relative to their peers, but this is not a compelling valuation but rather a reasonable valuation picture with superb growth! O.K. I am in love :). But I still don't have permission to buy any shares :(. Thanks again for visiting my blog! If you have any comments or questions, please feel free to leave them on the blog or email me at bobsadviceforstocks@lycos.com. If you get a chance, check out my Covestor Page where my Trading Account is reviewed, my SocialPicks page where my past stock picks are analyzed and reviewed, and my Podcast Page where I have discussed some of the many stocks I write about here on the blog. Wishing you all a wonderful end to the week! It has been a couple of months since I reported my Trading Portfolio. In fact, I last reviewed my portfolio on December 30, 2007. Since I am participating with Covestor, you can visit my Covestor Page where you can review daily updates of my trading portfolio including performance, holdings, and comments. However, Covestor calculates performance since my signing-up for this service (June 12, 2007), and since many of my holdings and investment experience predate that time, it may be helpful to review my performance since purchase of those stocks acquired prior to participating with Covestor. This review is the status of my account as of the close today, February 26, 2008. The holdings are listed in the alphabetic order of their symbols (as is done by Fidelity), followed by the number of shares, date of purchase, price of purchase, latest price (2/26/08), and percentage unrealized gain or (unrealized loss). Currently I am down to 7 positions, with my minimum number of positions being 5 and my maximum 20. My market value of my securities is $50,818.00, and I have an additional $619.03 in money market funds. In other words, with the decline, my margin has been paid off and I have a small balance. This is improved from the $(28,707.47) in margin reported two months ago which at that time made for an equity percentage of 68.30%. As of February 26, 2008, I had a net of $1,653.77 in realized gains consisting of $(1,629.73) in short-term losses and $3,283.50 in long-term gains in 2008. As of February 26, 2008, my stocks had a total of $15,266.17 in unrealized gains. As of this date, I have had $23.94 in total income and have paid $(221.13) in margin interest in 2008. 2008 has already been a challenging year for me. You will see that none of my stocks are showing losses, I have realized net gains for this year, and my system of responding to the market is automatically working as my total number of positions is down to 7. There has been rather 'slim pickings' around these parts both for blog entries and investment ideas. In fact the market tone has been rather dismal as in a reverse-Midas situation, everything I look at investment-wise has been turning from gold into something else. So with a bit of trepidation, I would like to share with you a stock that appears to well deserve a place on this website. Let me share with you some of the things that led me to this decision. I do not currently own any shares nor do I have any options in this stock. 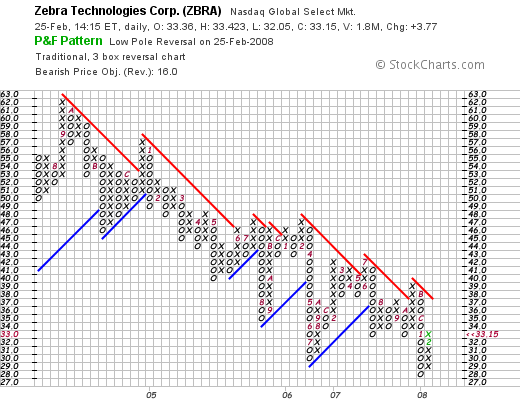 Zebra (ZBRA) came to my attention today when it made the list of top % gainers on the NASDAQ. As I write, ZBRA is trading at $33.10, up $3.72 or 12.66% on the day. First of all, what exactly does ZBRA do? "...engages in the design, manufacture, and distribution of specialty printing devices that print variable information on demand at the point of issuance. 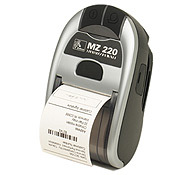 Its printers are used to produce bar code labels, passive RFID smart labels and tags, card laminates, thermal transfer ribbons, receipts, wristbands and tags, plastic cards, and photographs." Early this morning, Zebra Technologies announced 4th quarter 2007 results. For the quarter ended December 31, 2007, net sales came in at $233.6 million, up 11.3% from sales of $209.9 million in the same period the prior year. Net income was $30.8 million or $.45/diluted share, up from $21.4 million or $.30/diluted share last year. The company beat expectations on both earnings and revenue. Analysts polled by Thomson Financial had predicted earnings of $.43/share on $226 million of revenue. 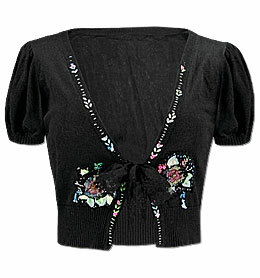 The company also raised guidance on revenue in the 1st quarter of 2008, and confirmed guidance on earnings expectations. This solid earnings report was enough to push the stock sharply higher today in trading. Reviewing the Morningstar.com "5-Yr Restated" financials on Zebra, we can see that revenue has continued its uninterrupted growth from $475.6 million in 2002 to $844.6 million in the trailing twelve months (TTM). Earnings have been more erratic with steady growth from $.95/share in 2002 to $1.59/share in 2004. However, earnings dipped to $1.47/share in 2005 and $1.00/share in 2006 and have only now rebounded to $1.45/share in the TTM. Outstanding shares are very stable at 70 million in 2002 and 70 million in the TTM. Free cash flow is positive and growing with $100 million in 2004, $69 million in 2006 and $137 million in the TTM. The balance sheet is solid with $33 million in cash and $504 million in other current assets. Compared to the $93.3 million in current liabilities, this yields a current ratio over 5! The company has a very small amount of long-term liabilities listed at $12.3 million. Reviewing Yahoo "Key Statistics" on ZBRA, we find that this company is a mid cap stock with a market capitalization of $2.26 billion. The trailing p/e is very reasonable at 22.88. No PEG is reported. According to the Fidelity.com eresearch website, the company has a Price/Sales (TTM) ratio of 2.39, well above the industry average of 0.82. Also per Fidelity, the Return on Equity (TTM) is below the industry average at 11.00%, with the industry average reported at 16.34%. Finishing up with Yahoo, there are 68.02 million outstanding shares with 64.70 million that float. As of 12/26/07, there were 2.98 million shares out short representing 4.5 trading days of volume (the 'short ratio'). No dividends are paid and the last stock split was a 3:2 split on August 26, 2004. 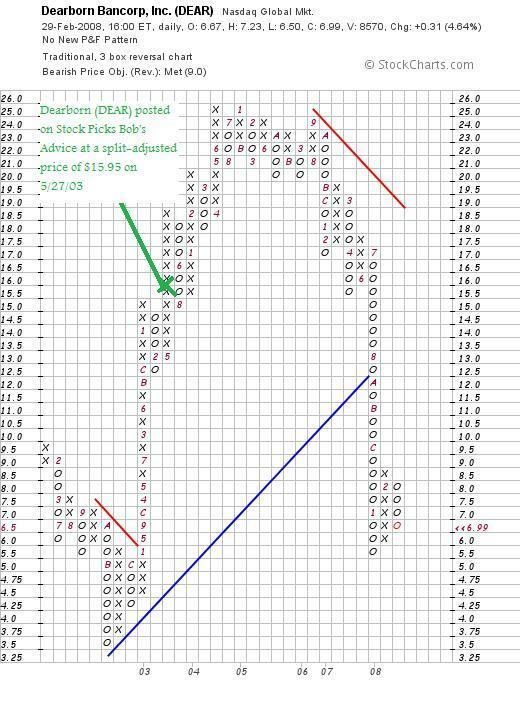 Reviewing the 'point & figure' chart on Zebra from StockCharts.com, we can see that this stock has an awful chart! The stock peaked at $62/share back in September, 2004, only to start a stepwise descent down to a recent low of $28 in January, 2008. The stock has been rebounding today, and on a technical basis, would like to see the stock trading above $41 before feeling like the downward trend may have been broken. Well, I like this stock. But with a couple of exceptions, the stock is a good pick. First of all, they had a great quarterly report. They beat expectations and raised guidance. I would like to see them do that again the next quarter as well! Longer-term, they have gotten 'off the track' the last couple of years and appear to be turning things around. It may be a bit early to predict whether this 'fix' is working. Valuation-wise, the Price/Sales is a tad rich and the Return on Equity, a tad anemic. Finally, the chart looks pretty awful. But certainly not over-valued. This is certainly not a typical CANSLIM pick. This is more of a GARP pick with the stock showing much better value in association with a recent strong growth record. It would be nice to see another quarter of solid earnings and revenue growth beating expectations. But like a reverse 'cockroach theory', when you see one good result like this, I do not think it would be surprising to see another in the future! Thanks again for visiting! If you have any comments or questions, please feel free to leave them on the blog or email me at bobsadviceforstocks@lycos.com. If you get a chance, be sure and visit my Covestor Page to follow my actual holdings, my SocialPicks Page to monitor my many stock picks, and my Podcast Page where you can listen to or download some of my 'radio shows' where I discuss some of the many stocks I have been writing about! It is the weekend and I wanted to get to a review this evening before I get behind in these reviews another week! As I have pointed out previously, these reviews assume a buy and hold strategy for investing. In actual practice, I employ an 'active portfolio management' approach, seeking to limit losses by selling losing investments quickly and seeking to preserve gains by targeted and partial sales of appreciating stocks. Certainly, the difference in strategy will affect overall performance, but for the ease of evaluation, I have chosen to continue to assume a 'buy and hold' approach for these reviews. On August 8, 2006, I posted inVentiv Health (VTIV) on Stock Picks when the stock was trading at $29.88/share. VTIV closed at $31.00 on February 22, 2008 for a gain of $1.12 or 3.7% since posting. On November 7, 2007, inVentiv announced 3rd quarter 2007 results. For the quarter, total revenues climbed 29% to $254.9 million compared to $197.8 million in the same quarter the prior year. GAAP income from continuing operations increased 38% to $14.1 million from $10.2 million the prior year. Adjusted diluted eps climbed 26% to $.43/share from $.34/share the prior year. Reviewing the Morningstar.com "5-Yr Restated" financials, we can see that while revenue growth is intact, earnings dipped the latest twelve months to $1.31/share from $1.70/share in 2006. Free cash flow, while also positive, dipped to $32 million in the TTM from $79 million in 2006. The balance sheet remains solid. 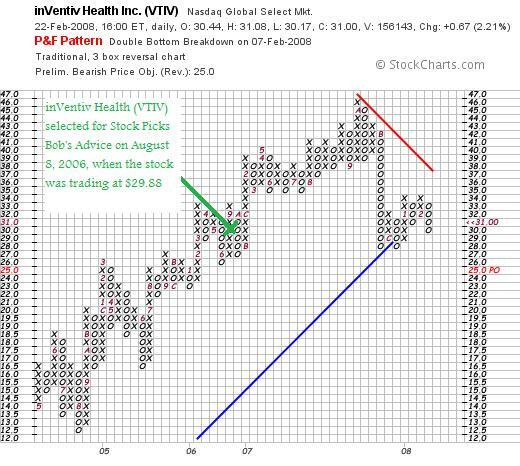 Reviewing the 'point & figure' chart on VTIV from StockCharts.com, we can see that the price broke down in November, 2007, when the stock dipped from $42 down to $28/share. The stock is still 'struggling' and does not appear to be respecting the blue 'support line'. 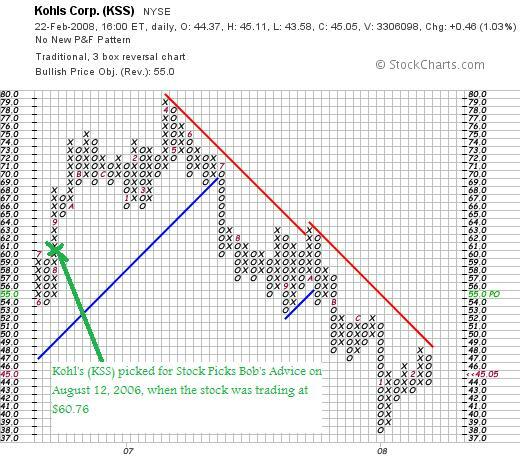 On August 12, 2006, I posted Kohl's (KSS) on Stock Picks Bob's Advice when the stock was trading at $60.76/share. KSS closed at $45.05 on February 22, 2008, for a loss of $(15.71)/share or (25.9)%. On February 7, 2008, Kohl's announced January same-store sales results and reported a decline of (8.3)% from the year-earlier period. Overall sales declined (20.4)% from last year. With the disappointing sales results, the company announced that the quarter's results "to be at the low end of our guidance of $1.30 to $1.34 per diluted share." On November 15, 2007, Kohl's (KSS) reported 3rd quarter results. For the quarter ended November 3, 2007, earnings came in at $.61/share down from $.68/share last year. Net income was $194.0 million down from $224.5 million. Sales for the quarter did increase to $3.8 billion from $3.7 billion the prior year. Reviewing the Morningstar.com "5-Yr Restated" financials, we can see that revenue growth remains intact, earnins growth is solid and the total shares are quite stable. Unfortunately, free cash flow which was a solid $1.96 billion in the black for 2007 has turned negative at $(427) million in the trailing twelve months. The balance sheet remains solid. Looking at the 'point & figure' chart on Kohl's from StockCharts.com, we can see that the stock turned lower in July, 2007, when it broke through support at $70 and has dipped as low as $38 before recently struggling higher to its current level still below the red 'resistance line'. So how did I do with these two stocks? Really pretty mediocre. inVentiv (VTIV) showed a gain of 3.7% since being 'picked' on the blog and Kohl's (KSS) had a loss of (25.9)% for an average loss of (11.1)% since posting. Thanks again for stopping by and visiting! If you have any comments or questions, please feel free to leave them on the blog or email me at bobsadviceforstocks@lycos.com. If you get a chance, be sure and visit my Covestor Page where you can see how all of the stocks that I actually own in my trading portfolio are performing, or visit my SocialPicks page where my stock picks from the last year and a half or so are evaluated and monitored. If you still have some time, be sure and stop by my Podcast Page where you can listen to me discuss some of the many stocks I write up here on the blog! Wishing you all a happy and healthy week ahead!